After all my business trip and an unbelievable, but far too short, 4 day stay in Bali in April I caught a reflection of myself in the mirror and thought who is that person staring back at me? Sometimes when I dine solo in places they ask that solo diners to sit at the counter, bar whatever you want to call it and well can you imagine the discomfort of sitting there worrying as to whether you backside is hanging out. Which is why I have always asked for a table, I may be solo but I want a table and not least because of backside exposure fear! I decided I needed to set myself a goal – run a half marathon or near enough 16km Paris-Versailles in September that way I: tick something off my bucket list, train and get back to my slimline self. To kick start this healthier approach I thought a solo dining outing at wholefood, healthy place – Nanashi – a Japanese inspired Bento. Why not, the Japanese are a thin bunch so maybe their way of eating might help me shift a few pounds! Nanashi is located in the Marais or Haut Marais where all the cool kids hang out and which is a stone throws from another favourite of mine L’Ilot. 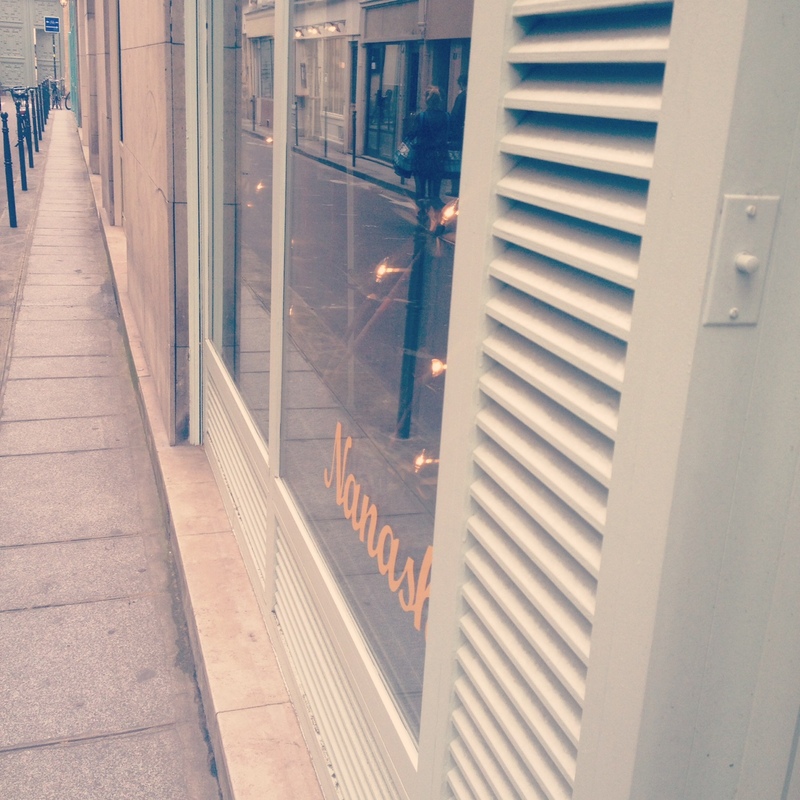 Nanashi dominates one side of the street and as you walk down to the front door you pass the open plan kitchen. I was greeted by the friendliest waiter who didn’t bat an eyelid when I said I wanted a table for one. No waiting for this solo diner. I was escorted straight to my table. Nanashi is popular. 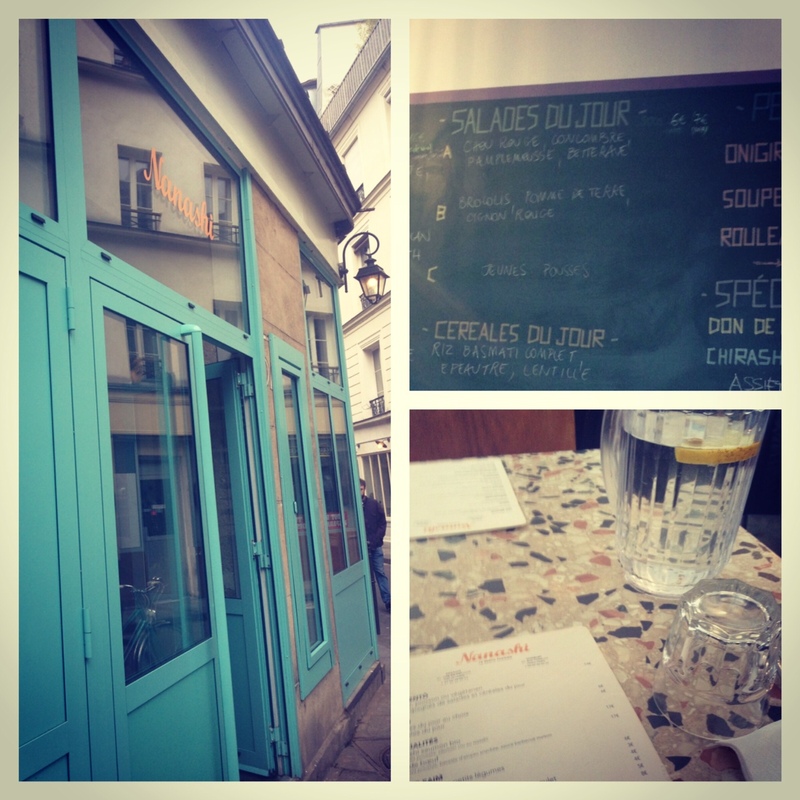 I arrived at 12.30pm and by 1pm, which is the traditional time at which Parisians lunch, the queue was out of the door. The restaurant is long and narrow with an array of tables and everyone be it journalists and creative types to mothers with children come here. The vibe is definitely a relaxed one and there is no rushing. I loved the fact that there was a large jug of water already waiting for me on the table with a slice of lemon. I sat down and looked at the menu as well as the green blackboard that takes up the whole of the back wall to see what the specials of the day were. An added bonus of this place is that they cater for food allergies including coeliac and lactose intolerant individuals who can eat here comfortably. It is all about eating well and wholesome at Nanashi with the principal dish – Le Bento Parisien – which is one part salad of the day and the other part either vegetarian, meat or fish option served on the grain of the day. If that isn’t really your thing then there are small dishes costing between €4 to 6, or if you are really hungry then large plates are €17. There are freshly squeezed juices for €6 and for those who just want to curb all that wholesomeness then wine and beers are also available – phew! 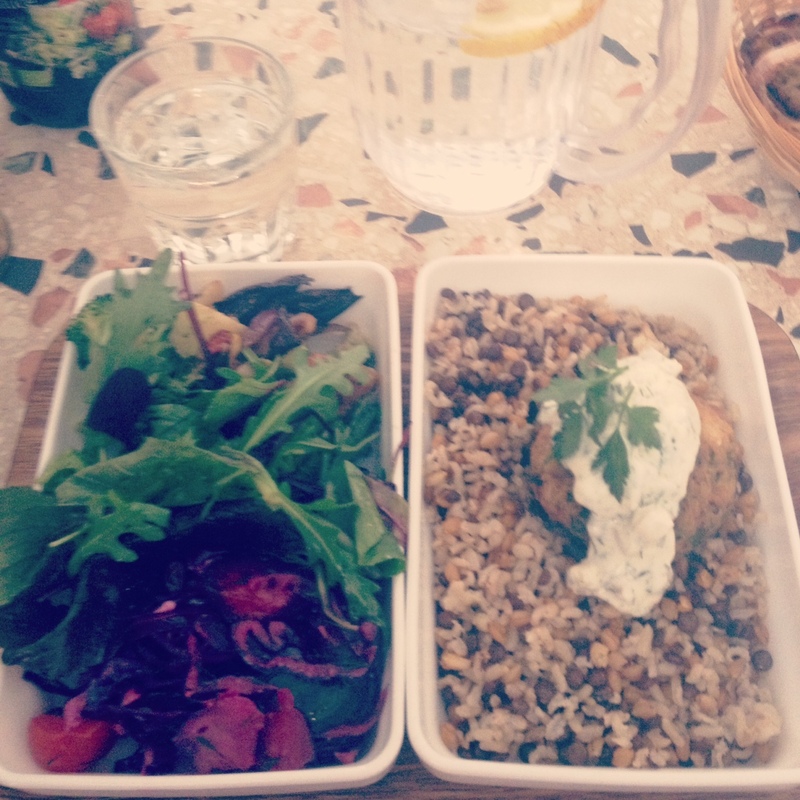 I came for healthy eating and that is what I was going to have a Fish Bento – one part salad with pickled vegetables accompanied by wholemeal basamti with a crispy ball of hake and yogurt and dill dressing to finish it off. I felt very virtuous eating my fish bento which was delicious washed down by the jug of lemon infused water. If I keep eating like this I’ll be Flash Gordonesque running the Paris-Versailles. Where? 57 rue Charlot 75003 and there are two other outposts in 6th and 10th arrondissements. Pricey? Le Bento Parisien I had was €14 and rises to €17 at dinner time.